Welcome to the West 1st Chiropractic Wellness Centre! Our practice is conveniently located in the heart of Kitsilano and is committed to servicing clients to enhance well-being. Dr. Trester is known to be able to identify problem areas and treat them with results while educating you on your health issues. The personal touch is what truly sets us apart, come visit us today and experience pain-free living! With Dr. Trester's vast experience and many years of chiropractic training and education, we have treated many patients with conditions ranging from whiplash to sports injuries. We have had remarkable results with these conditions and many others. 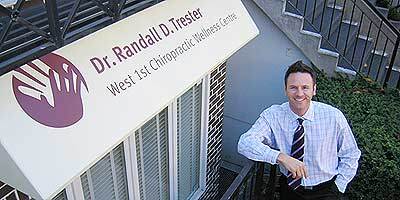 Patients seeking treatment are assured of receiving only the finest quality care, because Dr. Randall Trester has a genuine concern for your health and wellness. To find out more about how we can help you, feel free to go through our Areas of Focus page or contact us today to book your first appointment.